It is a great day to be swept away by a singer with exceptional talent. 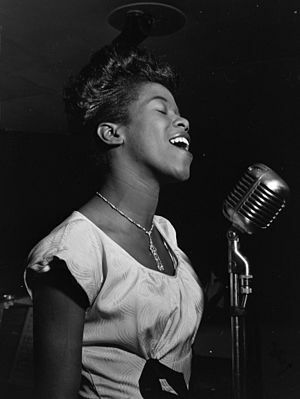 The late great Sarah Vaughan was such a singer. This track was taped in 1958 and is Sarah’s version of “Lover Man”. A standard jazz song that has also been recorded by such greats as Ella Fitzgerald, Etta James. Norah Jones, Billie Holiday and, strangely enough, Michael Jackson. The song was written for Billie Holiday in 1941 by Jimmy Davis, Roger Ramirez and James Sherman. The original by Billie was inducted to Grammy Hall of Fame in 1989. This entry was posted in Jazz, Live Music, Music History and tagged Jazz, live music, Lover Man, Music, Sarah Vaughan. Bookmark the permalink.